I have finally replaced my 45-year-old Crock-Pot even though it still functions. It was a very popular wedding present in the early 1970s! Over the years, it’s gotten quite a lot of use, but I’ve always complained that it was hard to clean (it couldn’t be immersed in water since it was all one piece). It also had no way to seer or brown meat so I rarely did anything with hamburger meat in it. The knob cracked on the inside; my husband glued it back together and onto the metal stem. My daughter is checking with the grad students in her department to see if anyone wants it; otherwise, I’ll put it in the donate pile I’m accumulating. And a stainless-steel pot that comes out for cleaning…can even go into the dishwasher. The first thing I tried was the Sauté function – making taco filling. It occurred to me that I might not ever use my electric skillet again. The down side is that the height of the Instant Pot makes it awkward to stir the contents of the pot for very long. I’ll probably still do most of my sauté (and stir fry) cooking on the stove top or move my cooking area to the kitchen table (lower than the cabinet) if I use the Instant Pot. The next experiment used the Pressure Cook function using a spicy beans recipe in the booklet that came with the Instant Pot. I cooked presoaked pinto beans…set the Pressure Cook feature for 10 minutes. It takes longer to build up the pressure and let the pressure out than to cook! The beans were very soft and I added some cut up arugula to make a dip for corn chips….a very good winter lunch right out of the pot; my husband and I are enjoying the leftovers. Overall – I have decided I like slow cooking rather then Pressure Cooking. I ordered a glass lid, so I can see what is cooking and reduce the bulk of the lid required for pressure cooking. 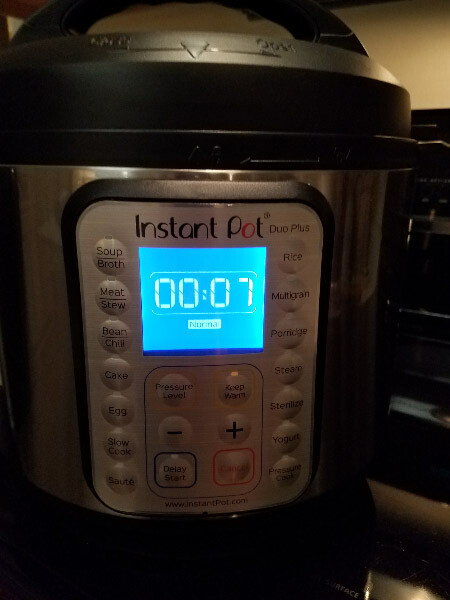 Because it is so easy to clean, I am anticipating I will use the Instant Pot frequently and replace some of my oven and stovetop cooking in addition to the foods I traditionally made in my old Crock Pot. Maybe eventually, I’ll build up a repertoire of Pressure Cook meals too.